In both business and personal affairs, it’s scientifically proven that setting clear and actionable goals increases your chances of growing or making meaningful change. But what does that really mean? Remember, it doesn’t have to be New Year’s Eve to make a change or decide to do something in your business (or your life) differently. The best time to set and assess your goals and milestones is right now. The reality is, most people’s New Year’s resolutions are completely out the window before the end of January, which warrants the question: What is going wrong? Why aren’t people following through on their resolutions? What can that tell us about how to set better goals all year long? There are many reasons people don’t stick to their goals. But the main reason is that people simply set the bar too high. Resolutions like “lose 50 pounds in two weeks” are unattainable, and people give up on their goal completely when results aren’t showing fast enough. In business, this is similar to earning $10K one year and expecting to have a 1,000 percent increase in revenue, when in reality there will probably only be a 10 to 15 percent increase (if nothing exponential has changed in your business). You need to create realistic expectations for yourself and your business. Although it’s unrealistic to set such high expectations initially, it’s not unwise to have lofty goals. Having an array of goals, ranging from ones that are achievable, likely, and possible, is great when thinking about the future. The “achievable” goals would be ones that can be completed in the near future, “likely” being ones that could be accomplished in the near future depending on certain factors, and “possible” goals being a little more far-fetched but could eventually happen if you or your business reach a certain point. Stop focusing on outliers, and instead use your own trends, benchmarks, and industry standards to set goals that are both achievable and push you to new heights. In most articles about goal setting, writing down your goals is a constant. Having a list of goals on your mobile phone, computer, or tablet may seem easier, as the list can be accessed on any of your devices, but it also makes it less visible. Keeping a list on a Google doc or in your “Notes” is not a tangible item that you can hold in your hand and check-off when necessary. Having a concrete list may seem like a minor factor in order to complete your goals, but according to the Goal Band Success System, “people with written goals are 50 percent more likely to achieve than people without goals.” They also note that out of every 100 adults, only three actually write their goals out on paper. It takes maybe ten minutes to write down a list, and carrying a piece of paper or notebook with you is hardly a challenge. 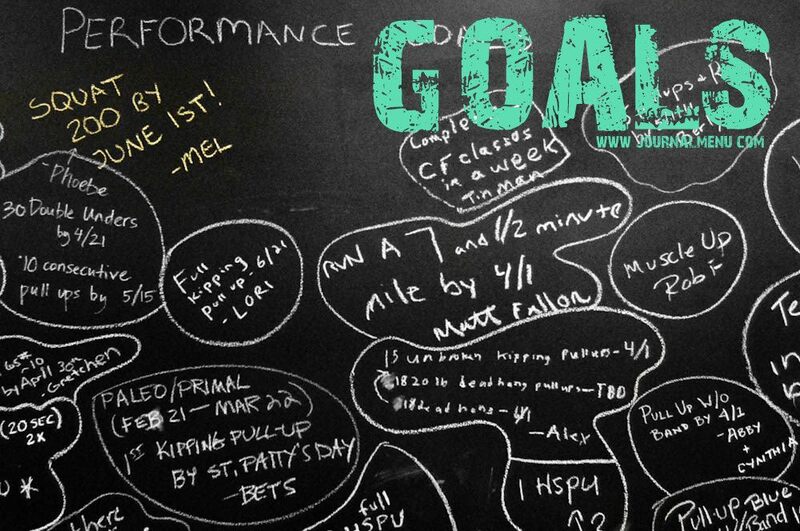 If your office has a whiteboard, that’s another great way to keep track of your goals. Keeping a list of goals in your workspace that’s visible to your whole team is a great way to keep people aware and accountable. While this specific example is not terribly organized, it represents an idea that can be easily implemented into any office or lifestyle. One way to adapt this method into your office is to write down goals for each week on Monday, and have everyone complete their individual task by Friday or the following week. If you need more convincing, check out this Forbes article for reasons why you should write out your goals. 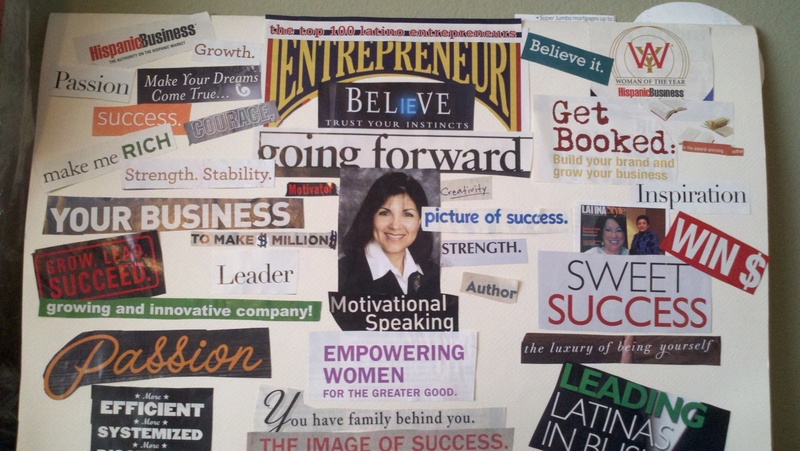 Creating a vision board is another great way to help accomplish your goals. Having a visual representation of all of your goals can help inspire you and allow you to tweak your vision along the way. For the same reason writing down is effective when trying to complete goals, vision boards use the power of visualization to help inspire and motivate. Having one of these boards in your home or workplace is the perfect way to set the bar for you and your team. It doesn’t have to be specifically work-related, but rather represent the attitude and quality of work you want to ultimately achieve. So many people try to make huge goals that seem daunting when you try to approach them. Instead, try to compile a list that works to complete one major goal, such as acquiring 50 new customers. You can’t just immediately accomplish this goal in one step—there are several smaller steps you have to complete first. Making “acquire 50 customers” its own list will make it seem more achievable, and also helps you see the progress you are making. Another important aspect of creating “mini-steps” is setting a complete-by date. If you don’t hold yourself accountable, who’s to say you won’t just push back each step, never completing your goals? Keeping a planner or scheduling reminders on your phone to ensure you accomplish each step is important. Check out this article that explains the “Stop Light Approach,” which further explains why taking “mini-steps” is important to achieve your goals, and how crucial time management is. It also talks about the importance of priority, and understanding which goals are more important or achievable. One of the easiest ways to see your goals through is to simply work—you don’t accomplish all of your goals doing the bare minimum. People with successful companies and fulfilling lives didn’t get there by doing nothing. You don’t have to accomplish some monumental goal initially. As I suggested above, take smaller steps throughout a period of time to achieve the ultimate goal. But even if these steps are smaller in comparison, that does not mean you should put in any less energy. Each step should be completed with the same amount of energy and devotion if you want the best end result. When you buy a gym membership, you have to go to the gym and work out in order to achieve your goal. Simply having the membership will not give you a better physique. Many people take the first step toward their goal but never follow through. Many of these unfinished goals are due to multiple factors, but also heavily rely on the amount of effort you ultimately put into it. A great way to ensure that you are putting in the appropriate amount of effort into each task is to make sure you don’t spread yourself too thin. Don’t try to complete and control every step of the process—trust your team to help you achieve your final goal. 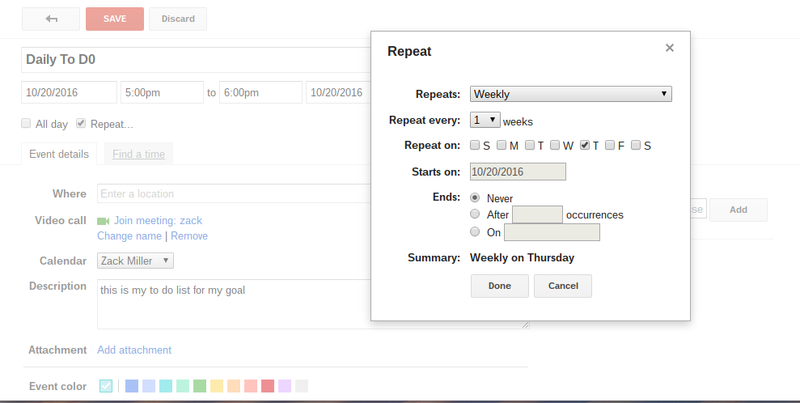 Put time to work on specific parts of your goal on your calendar the same way you would schedule an important meeting. One of the great benefits of having a team is that they can provide services or skills that you may not excel at. Say you want to build a website, but are horrible with graphic design. Having a team member or outsourcing to someone who excels in that area will help you achieve that goal. Vocalize the importance of each task and follow-up with each of member to ensure they are staying motivated and putting in the effort. Services like Basecamp are great sites to use for projects, as it makes it easy for people to communicate and visually see which tasks they need to do or have completed. Not achieving one of your goals should be a wake-up call to how you are managing each step. Maybe you need to have a team meeting to identify where the disconnect happened, or rework your project management style. Setting and accomplishing goals is an important aspect of building, growing, or improving your business—and also yourself. However, if there are complications or some unexpected factor derails your initial goal, it’s not the end of the world. Failure is a key benchmark for any business as it makes for a great learning experience. While you shouldn’t use this excuse for every goal that becomes difficult to achieve, it’s important to realize that one failure should not define your business or life. Zack Miller is an entrepreneur, author, and television/internet personality who has over two decades of business experience in starting, investing, advising, mentoring, and growing over six hundred companies or projects. These companies have made millions of dollars, been publicly traded, hustled to six figures of annual revenues, or failed and realized business isn't for them.